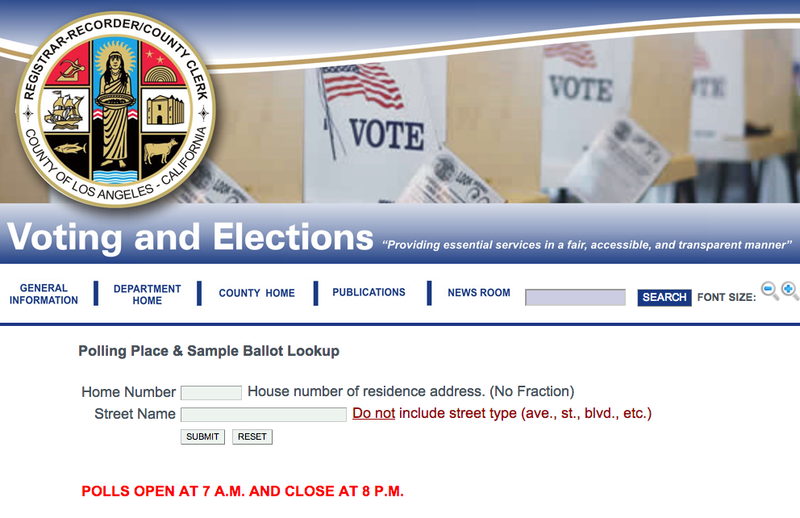 Click above to find your polling place if you live in the city of Los Angeles. As you may have heard, there’s a primary election Tuesday in Los Angeles to elect the next mayor of the second-largest city in the nation — a city with about 3.8 million inhabitants and some well-known transportation challenges. So even if you get all scratchy and/or break out in hives during campaign season, I’m here to kindly remind you to vote because there’s a lot at stake. Strike that. There’s tons at stake. Look up your polling place here. Here’s why. Metro is a county agency and is overseen by a 13 member Board of Directors who serve as the deciders on most significant issues. The Mayor of Los Angeles gets a seat on that board and gets to fill three other seats with his appointees. So let’s do some math! A majority of the Metro Board — i.e. seven votes — is required to approve most items. Four of those seven votes are controlled by the Los Angeles mayor. That means that the mayor controls more than half the votes needed to approve items that have impacts (hopefully always very positive!) across Los Angeles County. •Although there’s nothing currently on the table, there will likely be a discussion in the next four years about Metro’s fare structure — all large transit agencies have to confront the fare issue at regular intervals. If you’re one of the readers who has left countless comments on this blog calling for distance-based fares, then this might interest you. •Not long after the next mayor takes office, there will be five Metro Rail projects under construction simultaneously — Expo Line Phase 2, Gold Line Foothill Extension, Crenshaw/LAX Line, Regional Connector and Westside Subway Extension. That’s a lot of balls in the air. The Metro Board will have to deal with any significant issues that arise or are ongoing, such as the four lawsuits brought against the subway by the city of Beverly Hills and the Beverly Hills Unified School District. Or tying LAX to the Crenshaw/LAX Line. Fun fun fun! •The ExpressLanes one-year pilot program is well underway, now that the lanes are open on both the 10 and 110 freeways. When the pilot program is done, the Metro Board will get to decide what to do next with the congestion pricing experiment. I am willing to bet there is already not 100 percent consensus among the motoring public on this. •The SR-710 Study. I’m not sure I need to say more in order to tick someone off somewhere, but the environmental study for this project is scheduled to be completed in a couple of years. At that point, the Metro Board may decide which project alternatives to build. Or not build. In addition to the no-build option, the four alternatives still on the table are bus rapid transit (East L.A. to Pasadena), light rail (East L.A. to Pasadena), freeway tunnel (Alhambra to Pasadena) and traffic signal and intersection improvements. •And then there is the issue of accelerating Measure R projects. Half of the America Fast Forward program (a federal loan program) has been adopted by Congress. Mayor Antonio Villaraigosa and Metro are currently pushing for the other half (a bond program) and an extension of the loan program. The next mayor of Los Angeles, by virtue of their bully pulpit and influence, will have the option of pursuing America Fast Forward. They’ll also have a say over putting a transit tax before voters — there’s nothing proposed at the moment — and also can push or not push the state Legislature over the issue of whether the threshold for such taxes should remain at two-thirds or be lowered to 55 percent (as two different bills propose). It’s a big deal because some Measure R transit and road projects are currently scheduled to be completed in the late 2020s or in the 2030s — a long time from me typing this sentence at about 7 p.m. on the 4th of March, 2013. You don’t need me to tell you these are big and important issues that will impact mobility in the region, not to mention the area’s economy and overall livability. None of the above may have received much attention in the campaign thus far. But after the votes are counted tomorrow night it’s likely it’s likely there will be two candidates still standing and facing another 10 lovely weeks on the stump. RELATED: Here’s an L.A. Times survey of the five leading candidates’ views on local transportation issues.